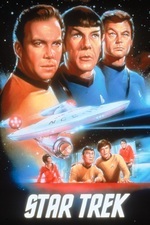 At Spock's court martial, he defends himself with mysterious footage which retells an ailing Capt. Pike's kidnapping by powerful illusion casting aliens thirteen years prior. Incorporating "The Cage" into the two-part episode, "The Menagerie", was actually a solution to a large and growing problem with the show's production. Its special effects, unprecedented for a weekly television production, were causing delays in the completion of each episode. The problem was cumulative, with shows getting delivered to NBC later and later. At its worst, episodes (filmed in Los Angeles) were being delivered to NBC (in New York) only three days before their scheduled Thursday airing. Sensing impending disaster, Roddenberry solved the problem by writing a two-part episode that needed only one week of production. He did this by writing an entirely new bookend story, so that "The Cage" would serve as a backstory for the Starship Enterprise's early history. New footage would be combined with the old and placed into the continuity of the overall Star Trek storyline. I skipped over the The Cage segments for part two, and I think this episode ended up running something like 15 minutes max. Whereas part one involved a lot more setup to lead to the situation, this episode definitely fell heavily into using the older footage. I can imagine the original audience likely enjoyed this older "history" they were watching and weren't handicapped by having watched the episode only about a month and a half ago. I definitely believe my feeling that Spock finally seemed like Spock, even the manner in which he spoke to Kirk. The twist that the admiral was never present showcased the extreme power of the Talos IV inhabitants - they're extending their mind powers over a distance that required something like five to six days of travel by the Enterprise. Frightening! Likewise, the convenient, "We're waiving the death penalty application in this instance!" was a little too neat of a bow on the package. It would not have been entirely out of place if Kirk had just turned to the camera, shrugged, grinned, and walked out of sight. Though, apparently the transporters were located immediately outside the door to the court martial room as the doors had only closed before the Talosians beeped Kirk and showed him that Pike was already on the planet.